It may be way too early to talk about which direction the so-called "Roberts Court" is likely to take now that the new Chief Justice has a full term under his robe. But it is not too early to declare that many of last autumn's Supreme Court prognosticators were right: the real power on this Court belongs to Justice Anthony Kennedy. Every Justice only has one vote, of course. But Justice Kennedy now holds in practice, if not by universal acclaim, the coveted "swing vote." And he was willing to use it to swing the law in his direction — slightly in some cases, mightily in others — in some of the last term's most controversial cases. Just last Thursday, for example, Justice Kennedy refused to permit what he considered an unlawful extension of the President's power to prosecute the Guantanamo Bay detainees. Although the majority opinion in that case still would have carried the day 4-3 without him (Chief Justice John G. Roberts, Jr. recused himself because he had ruled on the case while a lower federal appeals court judge), Kennedy's vote ensures that no Administration lawyer can now somehow claim that the ruling has no precedential effect because it commanded only a plurality of votes from the Justices. A day earlier, Justice Kennedy's vote alone kept alive the possibility, albeit remote, that the Court one day might declare unconstitutional partisan gerrymandering. Earlier last month, Justice Kennedy also ensured that an important case involving the environment, a case about whether certain wetlands are covered by the Clean Water Act, stayed alive on remand to the lower courts. The four most "conservative" Justices had voted against the environmentalists. The four most "liberal" Justices had voted in favor of them. Kennedy's vision—send the case back down for a more thorough analysis — prevailed. It's a simple mathematical equation. Chief Justice Roberts, and Justices Clarence Thomas, Antonin Scalia, and the newest Justice, Samuel A. Alito, Jr., are almost always going to vote in a bloc thanks to their shared judicial philosophy. The Supreme Court Institute at Georgetown University's Law Center reported last week in its end-of-the-term analysis that the new duo of Roberts and Alito voted together 90.9 percent of the time. The old duo of the right, Justices Thomas and Scalia, voted together 86.8 percent of the time. Roberts and Scalia voted together 86.4 percent of the time. You get the idea: The Four Horsemen of Fill-In-The-Blank. The Court's liberal and moderate wing — made up of Justice John Paul Stevens, Justice Ruth Bader Ginsburg, Justice Stephen Breyer and Justice David H. Souter — also tend to vote in a block, although with a smidge less reliability than their more conservative counterparts. Moderate Republican appointees Stevens and Souter, Georgetown reports, voted together 81.2 percent of the time. Clinton appointees Ginsburg and Breyer voted together 82.1 percent of the time. You get the idea: The Four Apostles of the Whatever. So Justice Kennedy, by politics, timing, math and default, is literally the man in the middle which, given the fact that he was an appointee of President Reagan, tells us all something about how much to the ideological right the Court has become since Earl Warren ran the show. Kennedy wrote a dissenting opinion only twice during the entire term (for comparison's sake, Justice Thomas, on the Court's far right, wrote nine dissents, while Justice Stevens, on the Court's far left, wrote a whopping 14). Georgetown also credited (or blamed) Justice Kennedy with writing five opinions in the term's most controversial cases, two more than his closest competitor. In so-called "high profile" cases, like the ones noted above, Justice Kennedy was in the majority a whopping 94.1 percent of time, often because his voted determined the majority. 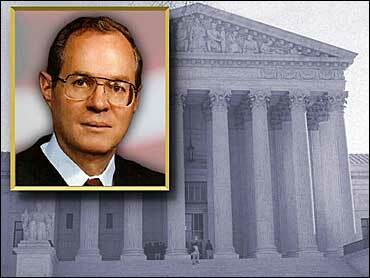 What does it mean that the "Roberts Court"-era starts off looking more like the Kennedy Court era? Well, if you are a lawyer preening for your next Supreme Court oral argument, you likely will focus upon what you think Justice Kennedy wants to hear because you know that he very well could be in the Court's majority if not himself the crucial "fifth" vote that wins you your case. This means that you will mold the legal standards and tests you are proposing as "solutions" to your case to fit, as best you can, your perception of Kennedy's judicial philosophy. That means that you will be pouring over Kennedy's prior rulings to figure out what winds his clock. And that means that Justice Kennedy will have an influence on the briefs and the argument in a way few (or none) of the other Justices have. If you are a lawyer pitching a more "liberal" argument, you are going to try to draw Justice Kennedy out and give him "conservative" reasons to vote your way. And if you are a lawyer pitching a more "conservative" argument, you are going to try to remind the Justice of his ideological roots. Attorneys used to focus their attention in this fashion upon Justice Sandra Day O'Connor, who happily I'm sure ceded her seat and her "swing" vote when she retired last term. None of this means that the other Justices will pay more or less attention to Justice Kennedy than they already do. And it certainly doesn't mean that Justice Kennedy, by virtue of Justice O'Connor's retirement, suddenly has any more power of persuasion among the Gang of Nine than anyone else. But still. Everyone knows that if you can get him on your side in the momentous cases of the term you have greatly improved your chances of success. He's not on the margins of the Court like several of his colleagues. He's right in the thick of the action. Because he showed this past term in that Clean Water Act case that he is not completely immune to concerns about the environment, we likely will see the Kennedy Effect next term in a huge environmental case the Justices last month agreed to hear and decide. The Court surprisingly agreed to determine whether the President is required by federal law, the Clean Air Act, to consider the emission of carbon dioxide (greenhouse gases) a "pollutant" harmful to health and thus susceptible to limitation by the government. There is little doubt that the vote will be close — probably 5-4 unless the Court limits its ruling to some sort of procedural angle — and little reason to believe that Justice Kennedy won't have a huge say in the outcome. On the contrary, Justice Kennedy is not likely to play a decisive role in next term's big abortion-rights case involving the late-term procedure abortion opponents call "partial-birth abortion." He already is on record as being in favor of statutes that ban the practice — he was in the dissent in a 2000 case that famously struck down Nebraska's effort to forbid the procedure. In the upcoming abortion case, it will be Justice Alito to whom all eyes will turn, to whom all arguments will be tailored, because he has replaced Justice O'Connor, the "swing" vote that doomed the Nebraska effort six years ago. It will take years for us to evaluate and determine what the "Roberts Court" really means. And even then there is no guarantee that a consensus will emerge. For example, countless trees already have been slain for the sake of law review articles debating the legacy of the Rehnquist Court — and thousands of new pages are sure to be added to the pile. In the meantime, the Supreme Court's rulings have an impact, often an immediate one, on the lives of millions of Americans. And Justice Kennedy has proven this term that his views and his votes have an extraordinary impact on the Court's rulings. Not bad for a guy who was President Reagan's third choice for the job.